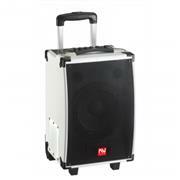 Liven up any event with this portable speaker! Stream music with Bluetooth from your compatible devices like a smartphone or tablet. Great for outdoor gatherings, events, tailgating or if you simply like quality sound while you're lounging. A microphone input allows you to plug in a mic and make announcements at your event.